Although it has long been assumed that the glacial–interglacial cycles of atmospheric CO2 occurred due to increased storage of CO2 in the ocean, with no change in the size of the “active” carbon inventory, there are signs that the geological CO2 supply rate to the active pool varied signiﬁcantly. The resulting changes of the carbon inventory cannot be assessed without constraining the rate of carbon removal from the system, which largely occurs in marine sediments. The oceanic supply of alkalinity is also removed by the burial of calcium carbonate in marine sediments, which plays a major role in air–sea partitioning of the active carbon inventory. Here, we present the ﬁrst global reconstruction of carbon and alkalinity burial in deep-sea sediments over the last glacial cycle. Although subject to large uncertainties, the reconstruction provides a ﬁrst-order constraint on the effects of changes in deep-sea burial ﬂuxes on global carbon and alkalinity inventories over the last glacial cycle. The results suggest that reduced burial of carbonate in the Atlantic Ocean was not entirely compensated by the increased burial in the Paciﬁc basin during the last glacial period, which would have caused a gradual build up of alkalinity in the ocean. We also consider the magnitude of possible changes in the larger but poorly constrained rates of burial on continental shelves, and show that these could have been signiﬁcantly larger than the deep-sea burial changes. The burial-driven inventory variations are sufﬁciently large to have signiﬁcantly altered the δ13C of the ocean–atmosphere carbon and changed the average dissolved inorganic carbon (DIC) and alkalinity oncentrations of the ocean by more than 100µM, conﬁrming that carbon burial uxes were a dynamic, interactive component of the glacial cycles that signiﬁcantly modiﬁed the size of the active carbon pool. Our results also suggest that geological sources and sinks were signiﬁcantly unbalanced during the late Holocene, leading to a slow net removal ﬂux on the order of 0.1PgCyr−1 prior to the rapid input of carbon during the industrial period. Oceanic uptake of anthropogenic CO2 leads to decreased pH, carbonate ion concentration, and saturation state with respect to CaCO3 minerals, causing increased dissolution of these minerals at the deep seafloor. This additional dissolution will figure prominently in the neutralization of man-made CO2. However, there has been no concerted assessment of the current extent of anthropogenic CaCO3 dissolution at the deep seafloor. Here, recent databases of bottom-water chemistry, benthic currents, and CaCO3 content of deep-sea sediments are combined with a rate model to derive the global distribution of benthic calcite dissolution rates and obtain primary confirmation of an anthropogenic component. By comparing preindustrial with present-day rates, we determine that significant anthropogenic dissolution now occurs in the western North Atlantic, amounting to 40–100% of the total seafloor dissolution at its most intense locations. At these locations, the calcite compensation depth has risen ∼300 m. Increased benthic dissolution was also revealed at various hot spots in the southern extent of the Atlantic, Indian, and Pacific Oceans. 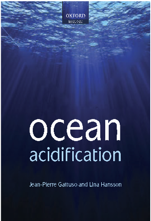 Our findings place constraints on future predictions of ocean acidification, are consequential to the fate of benthic calcifiers, and indicate that a by-product of human activities is currently altering the geological record of the deep sea. Determining the change of sea surface CO2 fugacity (fCO2) is important as the fCO2 gradient between the atmosphere and the ocean dictates the direction of CO2 flux and the fate of this greenhouse gas. While substantial efforts have been dedicated to the study of fCO2 trends in the open ocean, little is known regarding how fCO2 levels change in ocean margins. Meanwhile, hypoxia (i.e., dissolved oxygen concentration, or DO, less than 2 mg L-1) is becoming an increasing global threat in coastal areas. Elucidating the carbon sources that consume DO is important because it helps to make proper mitigation plans. In Chapter II, I used a newly available, community-based global CO2 database (Surface Ocean CO2 Atlas version 3) to develop a new statistical approach based on Generalized Additive Mixed Modeling (GAMM) to interpret oceanic fCO2 changes in ocean margins. This method utilized Julian day of year, sea surface salinity, sea surface temperature, and sampling date as predictors. Using the GAMM method, I was able to derive multi-decadal fCO2 trends with both improved precision and greater robustness to data gaps compared to the existing method. In Chapter III, I used the GAMM method on global ocean margins (within 400 km from the shore and 30°S-70°N) and found that fCO2 trends closely followed the atmospheric fCO2 increase rate. Further analysis suggested that fCO2 trends in Western Boundary Current- and Eastern Boundary Current-influenced areas differed in response to thermal (temperature) and nonthermal (chemical and biological) effects. These differences were due to heterogonous physical, chemical, and biological responses under climate change forcing, leading to divergent trends in CO2 sinks and sources among different ocean margins. To address the hypoxia formation mechanism question, I adopted the stable carbon isotope (δ13C) of dissolved inorganic carbon (or DIC, the end product of organic carbon degradation) as a proxy to trace back the δ13C of remineralized organic carbon that was responsible for DO consumption in the northern Gulf of Mexico (Chapter IV) and two semi-arid coastal bays in south Texas (Baffin Bay and Oso Bay) (Chapter V), the two areas that both experience seasonal bottom water hypoxia. My findings suggested that terrestrial carbon contributed to oxygen consumption in limited extent and mostly focused in areas where river water influence was significant in the northern Gulf of Mexico, while for the vast shelf areas marine-produced organic carbon was the dominant contributor to hypoxia formation. In Baffin Bay and Oso Bay, however, phytoplankton, seagrass/marsh organic carbon, and refractory terrestrial organic carbon all contributed to the DO loss under different hydrological conditions. This study provided a comprehensive data-driven analysis on ocean margin fCO2 changes on a multi-decadal timescale and revealed different behaviors of the two types of boundary current-dominated systems. Regarding the hypoxia formation mechanism in the different coastal and estuarine environments, my study suggested that eutrophication remained the top stressor that could lead to hypoxia formation. Therefore, sustained efforts that focus on reducing nutrient pollution should still be carried out to mitigate the hypoxia stress for the both ecologically and economically important coastal and estuarine systems. The complexities of the marine carbon cycle continue to be uncovered. 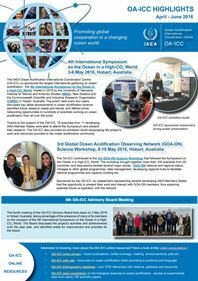 In this issue, Fassbender et al (2018) combined measured surface ocean partial pressure of carbon dioxide (pCO2) with model predictions of increases in dissolved inorganic carbon (DIC) to explore seasonal pCO2 changes. They find that when seasonal cycles of other variables (temperature, salinity, total alkalinity, and DIC) are maintained to climatological means, seasonal amplitudes of pCO2 are affected asymmetrically. Thus, even ignoring other natural or climate change factors, the assumption that the seasonal cycle of pCO2 will be preserved may not be valid. Fassbender et al. (2018) intentionally ignore the influence of other variables such as a global warming signal in order to hone in explicitly on carbon system dynamics. The results show that when studying CO2 fluxes, especially into the future, the full seasonal cycle must be investigated, as what happens at one time of year may not translate to the rest of the year. Practically, this means that in order to fully understand the marine carbon cycle and its control over atmospheric CO2 levels, there is an urgent need for more surface pCO2 data covering more months of the year particularly in the polar oceans which are highly seasonally biased. It has become clear that anthropogenic carbon invasion into the surface ocean drives changes in the seasonal cycles of carbon dioxide partial pressure (pCO2) and pH. However, it is not yet known whether the resulting sea‐air CO2 fluxes are symmetric in their seasonal expression. Here we consider a novel application of observational constraints and modeling inferences to test the hypothesis that changes in the ocean’s Revelle Factor facilitate a seasonally asymmetric response in pCO2 and the sea‐air CO2 flux. We use an analytical framework that builds on observed sea surface pCO2 variability for the modern era and incorporates transient dissolved inorganic carbon (DIC) concentrations from an Earth system model. Our findings reveal asymmetric amplification of pCO2 and pH seasonal cycles by a factor of two (or more) above pre‐industrial levels under RCP8.5. These changes are significantly larger than observed modes of interannual variability and are relevant to climate feedbacks associated with Revelle Factor perturbations. Notably, this response occurs in the absence of changes to the seasonal cycle amplitudes of DIC, total alkalinity, salinity, and temperature, indicating that significant alteration of surface pCO2 can occur without modifying the physical or biological ocean state. This result challenges the historical paradigm that if the same amount of carbon and nutrients is entrained and subsequently exported, there is no impact on anthropogenic carbon uptake. Anticipation of seasonal asymmetries in the sea surface pCO2 and CO2 flux response to ocean carbon uptake over the 21st century may have important implications for carbon cycle feedbacks. This work presents two new methods to estimate oceanic alkalinity (AT), dissolved inorganic carbon (CT), pH, and pCO2 from temperature, salinity, oxygen, and geolocation data. “CANYON-B” is a Bayesian neural network mapping that accurately reproduces GLODAPv2 bottle data and the biogeochemical relations contained therein. “CONTENT” combines and refines the four carbonate system variables to be consistent with carbonate chemistry. Both methods come with a robust uncertainty estimate that incorporates information from the local conditions. They are validated against independent GO-SHIP bottle and sensor data, and compare favorably to other state-of-the-art mapping methods. As “dynamic climatologies” they show comparable performance to classical climatologies on large scales but a much better representation on smaller scales (40–120 d, 500–1,500 km) compared to in situ data. The limits of these mappings are explored with pCO2 estimation in surface waters, i.e., at the edge of the domain with high intrinsic variability. In highly productive areas, there is a tendency for pCO2 overestimation due to decoupling of the O2 and C cycles by air-sea gas exchange, but global surface pCO2 estimates are unbiased compared to a monthly climatology. CANYON-B and CONTENT are highly useful as transfer functions between components of the ocean observing system (GO-SHIP repeat hydrography, BGC-Argo, underway observations) and permit the synergistic use of these highly complementary systems, both in spatial/temporal coverage and number of observations. Through easily and robotically-accessible observations they allow densification of more difficult-to-observe variables (e.g., 15 times denser AT and CT compared to direct measurements). At the same time, they give access to the complete carbonate system. This potential is demonstrated by an observation-based global analysis of the Revelle buffer factor, which shows a significant, high latitude-intensified increase between +0.1 and +0.4 units per decade. This shows the utility that such transfer functions with realistic uncertainty estimates provide to ocean biogeochemistry and global climate change research. In addition, CANYON-B provides robust and accurate estimates of nitrate, phosphate, and silicate. Matlab and R code are available at https://github.com/HCBScienceProducts/.